Cast iron skillets aren’t just for scrambling your eggs in the morning anymore. Just like one pot and crock pot recipes, these skillet meals are simple to make and incredibly delicious. You won’t be able to choose which one to make first! That’s right, you can make risotto in a skillet. All you’ll need for this creamy recipe is golden beets, blue cheese and a whole lot of paremsean. I would never have thought to combine these two amazing ingredients into one skillet recipe: sweet potatoes and eggs. With a healthy portion of mozzarella, you will have an amazingly cheesy dish for breakfast, lunch or dinner. Easy-to-make fried chicken can be accomplished with some chicken breasts, bread crumbs, oil and – of course – your handy skillet. This Italian classic can be cooked to perfection in your cast iron skillet! 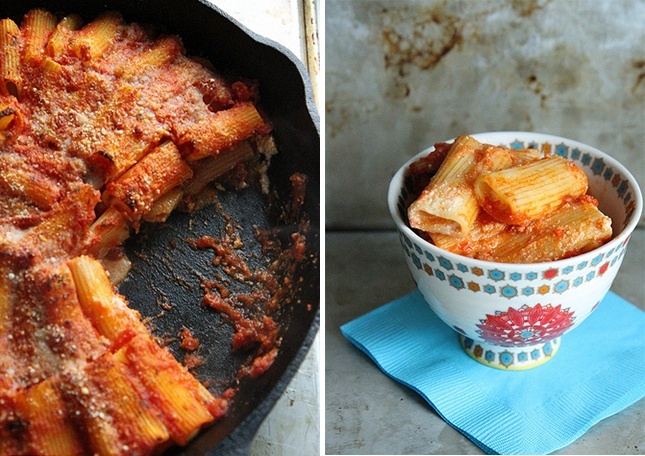 Simply stuff your rigatoni with ricotta and goat cheese then drench it in marinara and enjoy! In a perfect union of Italian and Thai food, these turkey meatball are marinated in green curry and best served with basil garnish. Scones are not just for breakfast. Stuffed with red pepper and fetta and cooked in your handy skillet, you can slice up this delicious take on the scone for up to 10 guests. Artichoke spinach dip is a huge trend. Now you can make it at home with cheesy, pull-apart bread…yes, please. This skillet pizza can be customized with your favorite toppings AND can be made in three minutes. Hello, dinner. Think lasagna is a tough recipe to make? This skillet version can be made in a snap and leaves you with an extra cheesy dinner in practically no time at all. Giant cinnamon roll. This is not a joke. Although the dutch baby is a more difficult recipe, this delicious result is completely worth giving it a try. Mom’s favorite can be easily made in your cast iron skillet! Thin crust isn’t your only skillet pizza option. With some thick crust and extra cheese, you can have a deep dish version, too! This looks unreal. A gooey, deep dish chocolate chip cookie covered in caramel? Sign us up. Dessert dips are a home run with party guests. Good news – this take on your summer favorite can be served straight from the skillet.